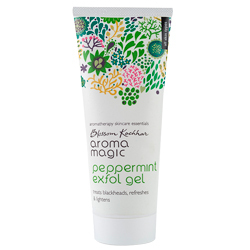 Buy Aroma Magic Peppermint Exfol Gel Treats Blackheads, Refreshes & Lighten Skin - Aromatherapy Skin Care Essentials. Treats blackheads, refreshes and lightens. 100% free of harsh chemicals, alchohol, parabens, phthalates, sulphates, artifical fragrance & colouring. As an exfoliating gel enriched with active enzymes, deep clean & lighten your skin leaving it blemish free and refreshed, without irritating or scratching the delicate and sensitive skin on your face and neck. Unique combination of natural ingredients of cornflower,lemon balm,orange extracts gently dissolves the dry flakes & impurities blocking the pores of the skin. Aromatherapy blend of lavender and peppermint essential oils provides a protective shield, hydrates your skin and helps to awaken your senses. Apply scrub on your face, neck and body. Massage gently with dry fingers and rinse off. For best results, leave it on for 10 minutes before rinsing. Pat your skin dry with a soft towel and continue with the rest of your skin care routine. Use twice a week. Aqua, Centaurea Cyanus Extract, Vegetable Glycerin, Aloe Barbadensis Leaf Gel, Peppermint essential oil, Lavendula Angustifolla Oil, Orange Acid, Mellissa Officinalis Extract, Food Grade Colour.